Kitimat Part of the BC Adventure Network. Over a million web site visitors annually ! For those interested in nature and industry, Kitimat is an excellent choice. The community enjoys a beautiful natural setting and is also home to some of the most advanced industrial technology in North America. Located 60 km (38 mi.) 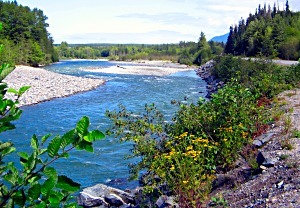 south of Terrace, Kitimat was built in the 1950's to attract industry. It is home to one of the world's largest smelters as well as a pulp and paper mill and petrochemical manufacturer. You can tour one of these enterprises or head for the country for some "natural" sites. A trip to the Kitlope Valley (100 km/62 mi. 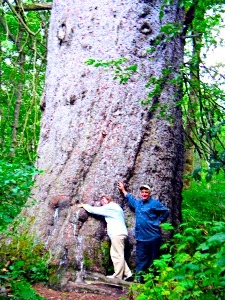 southeast of Kitimat) offers visitors a glimpse of the world's largest intact coastal temperate rainforest. 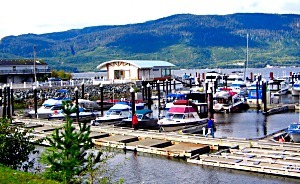 Closer to town, the Kitimat River Fish Hatchery or Douglas Channel, the 130 nautical mile fjord, offer spectacular sights as well as recreational opportunities such as outstanding fishing, wildlife viewing or even basking in one of the nearby hot springs. Kitimat and area also offer an extensive hiking trail system; heli-hiking tours are even offered for those who desire quick access into alpine areas. 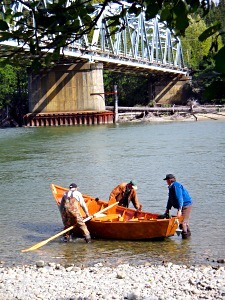 For those interested in First Nations culture, the Haisla Rediscovery Society offers rediscovery camps in the Kitlope and welcomes all people to participate. With Kitimat having something to offer everyone, it continues to attract visitors from around the world. Accommodations: There are numerous hotels/motels in the area as well as three campgrounds. Recreation Facilities & Activities: racquet courts, gym, soccer and baseball fields, skating rinks, aquatic centre, golf course, established hiking trails, heli-hiking tours, fishing, swimming, camping, scuba diving, water-skiing, wildlife viewing, charter fishing companies.